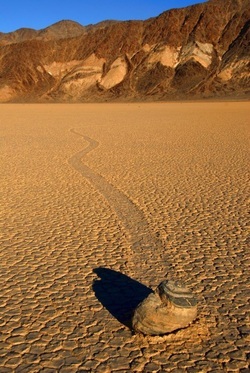 Death Valley National Park in California is home to a place called The Racetrack Playa. 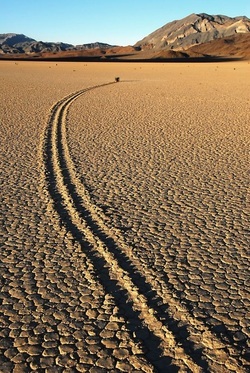 The Racetrack is a dry lake situated 1130m above sea level, and even though it is 4.5km long, the ground is surprisingly flat, with only a 4cm height differential between the north and south ends. The mountains surrounding the Racetrack, comprised primarily of dark dolomite, reach as high as 1731m above the lake bed. When the heavy rains come, water rushes down the mountains and onto the lake bed, forming a shallow endorheic lake. Due to the hot temperatures of the region, the water evaporates, leaving behind a layer of soft mud. When the liquid fully evaporates, the ground cracks and leaves a mosaic pattern behind. While all of this is interesting, the feature that makes this area truly unique is something that has yet to be fully understood by the scientific community. A baffling phenomenon of nature or a paranormal display of supernatural existence or is it an alien intervention? Questions still remain unanswered while experts are still nailing down on what could be the accurate reason behind stones of Death Valley that slide by themselves, without the interference of humans or animals. In the southwest of the United States of America, lies this mysterious valley- popular as the hottest and driest location in North America. 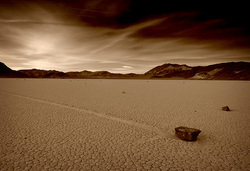 This lowest lying point of the continent is a deserted floor located in the Inyo Country by the border of California and Nevada, and consists of a dry lakebed named ‘Racetrack Playa’ which is proved to have the motion of rocks every two or three years. 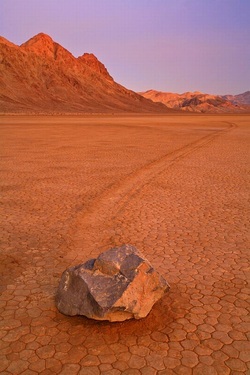 These gigantic rocks and boulders (known as Sailing Stones, Sliding Rocks, or Moving Rocks) are found all over the dry lake bed with long trails, or racetracks, having formed behind them, extending for hundreds of meters. Since there is no evidence of human or animal intervention in the movement of these stones, one has to wonder how the phenomenon is happening. 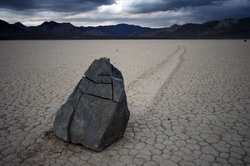 ‘Sailing Stones’ of Death Valley- named from their distinctive and mysterious feature are in a count of hundreds scattered allover the Racetrack Playa from the size of a pebble to as large as huge boulders. The playa which is nothing but a flat bed of scorched mud observes the sailing of such stones surprisingly in straight tracks on its broken surface of flat octagons and pentagons. While the stones having rough bottoms tend to form smooth straight tracks, stones with smoother bottom are found wandering in an unorganized pattern. Stones also tend to turn over during this process leading all the way to another track. 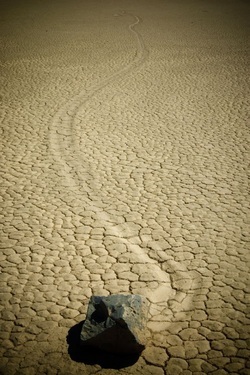 Like the size and shape of sailing stones, its component also happens to vary all over the Racetrack Playa. In the southern end of the region, they’re found to be made of dark dolomite, while the stones from the adjacent slopes consist more of tan-colored igneous rock. 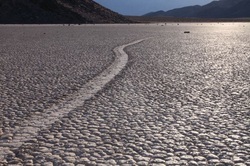 From as small as 10 feet to as long as 100 feet, the tracks formed by these sailing stones are usually 2.5 cms deep and 4-12 inches wide, consisting of silt and clay sediments and last usually for three to four years. Even though this geological phenomenon is a mystery and still a subject under research, various speculations have been made on the exact reason behind the sailing of the stones. Scientists say it may be an outcome of strong winter winds with a speed of up to 90 mph, while the playa is slippery enough during rainfalls. This assumption is rightly explained with the understanding of the prevailing winds across Racetrack Playa that blow from southwest to northeast and most rock trails are found parallel to this direction. The ice sheet theory is also been proposed by a different set of scientists stating that the rocks get moved easily by the wind on the ice layers formed on the floor during low temperatures. Somehow, this happens to be the still a theory leaving behind lots of arguments. However, all the studies prove that there are certain common factors between all the sizes, shapes of types of stones and tracks that aids the movement of the stones, be it a saturated non-flooded surface, thin layer of clay, tough draft as an initiating force or a strong wind to help the stones slide by themselves. Till date these mysterious stones and their movement remains un-filmed and unobserved by human eyes, but the various speculations made by experts keep us driving towards this mystical happening of nature wondering how this could be possible.